There has been one thing holding me back from ever dining at 50’s Prime Time Cafe in Disney’s Hollywood Studios: Fear (capital F). I am made so completely anxious and nervous by any type of crowd participation, that the fear of being told to get my elbows off the table, or to clear my plate has kept me away from this DHS mainstay. Even when I heard tell of vegan meatballs on the menu, I kept my distance to avoid any playful interaction that might await me. The few times I have visited DHS in recent months, I have always looked longingly at 50’s Prime Time Cafe. I knew the decor and theming of the restaurant was right up my alley (starburst clocks! Danish-made end tables! ), and those vegan meatballs were an actual menu item. Still, I stayed away, until very recently when I decided it was time to face my fear. I sucked it up, and walked inside, sheepishly being prepared to be yelled at by my server for not holding my fork properly. It was a rainy night at DHS, so the Tune In Lounge was crowded but I love the atmosphere in there anyway. When the hostess called, or yelled my party’s name, we followed her to a table in a room that is themed just how I’d love my whole apartment to look, perfectly 50’s. Much to my surprise, the server gave me no guff at all, about anything, not even when I asked if the Spaghetti and Meatless Meatballs (on the menu as Sissy’s Vegetarian Favorite Multigrain Spaghetti) was vegan. He got the chef from the kitchen, who was also really really nice, and the chef confirmed the dish was, in fact, vegan and he even said he could make me a vegan milkshake. What the what!? A vegan milkshake? At a Disney Park? Yes please! The entree arrived, looking delicious, and the portion was huge! It tasted amazing. 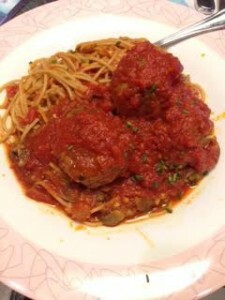 The pasta was well cooked, the sauce was particularly tomato-ey without being too salty, the meatless meatballs were fantastic, and there were even some mushrooms hidden on my 50’s inspired boomerang plate! The entree was very worth the $16.99, and offered too much food for me to finish. Though I barely had the ability to eat another bite, when someone says “vegan milkshake” I can’t help but nod my head with an affirmative ‘yes.’ I was torn between two options, plain vanilla (to be safe and boring), or peanut butter and jelly. It was the jelly that made me wary, but then our server promised the shake wouldn’t have a jelly taste to it, and the choice was clear. Oh my god. I’m so happy I opted for the PB&J. It was essentially a peanut butter shake, and heaven in a cup. I will brave any Frozen-themed singalong to venture back to 50’s Prime Time for this shake. Even if you’re not vegan or vegetarian, I suggest giving this dish, or at least the vegan PB&J shake a try. I think you’ll be pleasantly surprised! Emily Woesthoff is the General Manager of BabycakesNYC – Orlando. Babycakes supplies vegan, gluten-free baked goods to Walt Disney World resorts and parks, and can be ordered for delivery in the Orlando area for your special occasion. We’ll have to try this place someday. Glad to hear that the vegan option is really good. Thank you, Peter! I hope you enjoy it, too! Regarding the meatballs, I haven’t checked the ingredient list, but I’d say it’s largely grain-based but with a good texture, not too well, grainy. Hi Belinda! I’m not completely certain, but Ibelieve they were the Gardein brand. If that’s the case, they would be soy-based and wheat-based. I’m going to investigate to see if I can get a solid answer as to which brand they use. The milkshake was made with Tofutti, so it was soy-based. Thank you so much for reading, and commenting! Hey Emily 🙂 Thanks so much for checking on that – that actually sounds really tasty! I might just try that on our trip in January. I love how WDW is so diverse! The same fear has made me hesitate to book this restaurant in the past. But, since one member of our party is dairy and egg free, it seems like it might be worth it on our next trip. I’m so glad you understand! It was a great experience, and I think you will have a wonderful time. Enjoy! I am a vegetarian and ordered this when we ate at the 50’s Prime Time Cafe during our vacation about a month ago. I agree that it was really delicious and such a treat to find a really tasty vegetarian meal at Disney. Our server was fun but very low key. We really enjoyed our dining experience. I’m glad to hear you liked it, too! Low-key fun is right up my alley. This is one of my favorite ‘on the menu’ vegetarian items on property (Sanaa always wins of course). I’ve always found it to be well spiced, flavorful, and perfectly cooked. Also, for those who might not want to risk the 50’s signature server banter, sit up at the bar (The Tune In Lounge) for a less ‘in character’ experience with all the options. Thank you, Bill H. Let’s go get shakes at the Tune In. Your dramatics about not wanting to eat there were a bit much. Agreed. Two or three of the new bloggers substitute hyperbole for useful facts and exclamation points for wit or style. If I had a “Fear” of crowd participation and playful interaction the last place I would visit would be Walt Disney World. Talk about first world problems, “oh my god,” which milkshake to order. I would classify this more under “first world commentary,” since the experience was really enjoyable, and since it’s a blog about a theme park. Thank you for reading! Wow – how rude. I totally understand the author’s apprehension as I am the same way, and yet WDW is one of my favorite places. Fear of being pulled into a performance/ having attention called to you has nothing to do with enjoying WDW. Thank you for the comment, B! I am totally with you about fear of being pulled into a performance. Monsters Inc. Laugh Floor makes me cringe! Maybe, but I have encountered quite a number of people who have been nervous about dining at this restaurant for the reasons mentioned above. I’m hoping this might help to change the minds of wary adults, or shy children. Thanks for reading! I completely understand the fear – I don’t like to be called on in group participation myself. However, I have had many good experiences there. And here’s a tip – you can enjoy a lot of the atmosphere/decor and get full menu options if you sit at the bar. Very often, you can get a seat at the bar when you can’t get a reservation. You won’t get the same “mind your manners”, etc… but for those people who are reluctant to experience that part, the bar is a great option! Thanks, Melissa! I think I will head to the bar as soon as possible for another shake! Really enjoy reading your posts! I love that there are so many options for vegans in WDW. We haven’t been to 50’s in years- its now on our list to try the next trip. I do miss Babycakes at DTD! I hope there are plans to bring it back at some point. Thank you for reading, Niki, I hope you love your experience there! Thank you for the kind words about the bakery, we miss it, too! The Vegan Meatballs do contain wheat but they are not Gardein – they are made at a Kitchen at DHS or Disney. They also offer a vegan and gluten free brownie that is made on site as well.